Two Princeton economists, Anne Case and Angus Deaton, analyzed health and mortality data from the Centers for Disease Control and Prevention and other sources and concluded that middle-aged white Americans aren’t doing very well: In contrast to every other age group and every other racial and ethnic group since the late 1990’s death rates for white men and women aged 45 to 54 have been climbing. The uptick is largely attributed to increases in drug abuse, alcoholism and suicide and is particularly pronounced among those with a high school education or less. Please join us to discuss why the death rate for middle-aged whites is on the rise. MS. DIANE REHMThanks for joining us. I'm Diane Rehm. 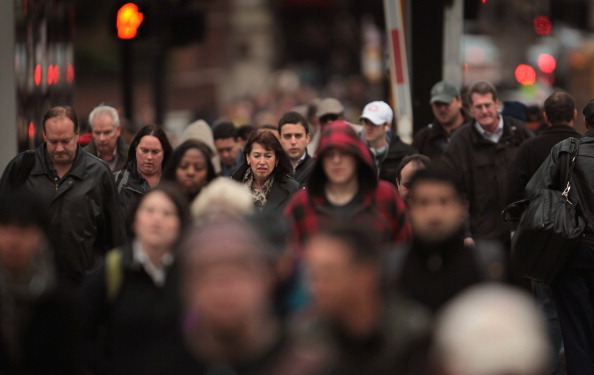 New research indicates that middle-aged white Americans have an unfortunate distinction. Unlike every other race, age and ethnic group, the death rate for Americans aged 45 to 54 is rising. Joining me to talk about the rate and what it means, John Haaga of The National Institute on Aging at the National Institutes of Health, Beth Kane-Davidson of the Johns Hopkins Medical Institute, Dante Chinni of The Wall Street Journal. MS. DIANE REHMAnd from a studio at Dartmouth College, Ellen Meara of the Dartmouth Institute for Health Policy and Clinical Practice. But first, a conversation I had yesterday with Anne Case, professor of economics and public affairs at Princeton University. She and her husband, Angus Deaton, also an economist at Princeton and winner of the 2015 Nobel Memorial Prize in economic science, were coauthors of the new report. Anne Case was in Dublin, Ireland, when we spoke. MS. DIANE REHMIf you can explain, tell us what prompted you and your husband, Dr. Angus Deaton, to look at this particular group of people. MS. ANNE CASEWell, we were interested in what was happening to the health of people in late middle age and at the same time, we were interested in what was happening to suicide rates in the U.S. and to see whether or not regions were people were more likely to kill themselves were also regions where people were reporting themselves to be less happy. MS. ANNE CASEAngus Deaton has been working for several years now with the Gallup organization who run a poll and they actually ask people to rate their life satisfaction. And so I was looking at pain, at mental health, at people's ability to go about their daily living. He was looking at suicide and we realized that there was real deterioration on both of those dimensions and we decided it would interesting to look at both of those two things together because we were seeing such stunning results. REHMWell, and actually, they would be connected if one is suffering pain and sees no way out. There may be only suicide. CASEYes. No, indeed. To put the suicide numbers into context, we actually felt we should look at the overall mortality rates for people in middle age and we were just amazed to see that after decades of decline, mortality rates among whites in the U.S. began to rise, starting in the late 1990s. And that set us apart from all of our comparison countries, from the countries of Europe, from the other English-speaking countries, like Australia, New Zealand, Canada. REHMNow, I gather that middle-aged blacks still have a higher mortality rate than whites. CASEThey have a higher mortality rate, but the rate of decline continues to be extremely positive in the sense that they are seeing about a 2.6 percent per year decline in their mortality rates in middle age. Hispanics are seeing about a 2 percent decline in their mortality rates in middle age. But for whites, it began to increase at about half a percentage point a year. REHMSo Dr. Case, how do you interpret these facts? How do you begin to look at what's happening and begin to figure out why? CASEWell, we see mortality rates increasing for three kinds of deaths that we think of as deaths of despair, suicides, drug overdoses, cirrhosis and alcoholic liver disease. One of the proximate causes of this is that in the late 1990s, the availability of prescription opiods just increased dramatically. So at a proximate level, many of these deaths can be attached probably to the massive increase in opioid prescription and to an increase in the availability of very low cost, high quality heroin, which began to come in Mexico at the same time. CASENow, one wonders, you know, why is it that people began to use these drugs or drink more heavily or commit suicide, which leads you to sort of, like, what are the deeper causes? The proximate causes we can identify, but the deeper ones, for that, we kind of focus on the fact that it's people with a high school degree or less who see the most rapid increase in their mortality rates for all three of these, cirrhosis, drug overdoses, suicides. REHMSo what you're saying is that they suffer from the economic changes, but they are not somehow emotionally strong enough to weather those changes and so they then turn either drugs, medications or heroin to ease the mental suffering. CASEWell, we don't -- we can't say that for certain now because we -- while we've kind of uncovered a set of facts, there's going to be a lot more work necessary to say any of this with any certainty. But it would seem likely that people who used to be able to be guaranteed a good job with a high school degree, a job that would come with benefits, a job that would've come with real job security, those jobs are gone. Those jobs are not coming back any time soon. CASESo people who would've expected, would've anticipated that they would, with a high school degree, be able to earn a good living and support a family, are finding they're unable to do so, so we've -- go ahead. REHMI was just going to say it's so interesting because middle-age with all of its changes comes with challenges of its own. Just the idea of growing older and that there may be less time ahead than there has been before. CASEAlthough, it's interesting, the elderly are doing very well. The elderly are reporting themselves, year on year, as being in better health. The elderly, year on year, report their mental health to be better. So what we're seeing, ironically, is that middle-aged people are reporting more morbidity and their mortality is increasing whereas the elderly are actually doing very well. REHMWhat about geography and whether that plays a role here, especially in the United States? CASEIn the United States, we hope to do much more of this work and look at a much finer level of detail. Currently, what we know is that if you break the country down into census regions, northeast, south, Midwest, west, we see the same phenomenon at work in all four parts of the country. REHMInteresting. Dr. Anne Case, thank you so much for joining us. REHMHow fascinating to hear from Anne Case. And I must say, John Haaga, hearing her use the phrase "deaths of despair" in that particular age group, did these findings surprise you? DR. JOHN HAAGAYes. I have to say they did and not just me, but most demographers. It was a real tribute to them that they picked up and looked at an age group that most people just don't cut the data that way. I think a lot of times in science, the advances come when you take something and just look at it a different way and that's really what they did. But certainly, no one was expecting this reversal and it goes against decades, as she mentioned, of trends of generally slow but definite improvement. REHMDr. John Haaga, he's acting director of the division of behavioral and social research at the National Institute on Aging. We'll take a short break here. When we come back, we'll speak with our other guest, one of whom is always you. REHMAnd welcome back. We're talking about a brand new study just released by two Princeton economists analyzing health and mortality data from the CDC and other sources, concluding that middle-age white Americans are not doing well in contrast to every other age group and every other racial and ethnic group. The death rates for white men and women age 45 to 54 are climbing. Here in the studio with me, John Haaga of the National Institute on Aging, National Institutes of Health, Beth Kane-Davidson, she's director of the Addiction Treatment Center at Suburban Hospital, of the Johns Hopkins Medical Institute and Dante Chinni, he's data and political reporter for the Wall Street Journal and director of the American Communities Project for Michigan State University. Joining us by phone and Skype, Ellen Meara, she's associate professor at The Dartmouth Institute for Health Policy & Clinical Practice. REHMEllen Meara, it really is so important to note that while the death rates seem to be ticking up for whites, among other groups it's going down. Now what do you make of this? MS. ELLEN MEARAI think that that's essentially the point that is most surprising and the point that they've put in sharp relief in this paper, that yes, mortality rates are climbing for whites during this period, but they're falling quite dramatically, and we should be quite happy with what we're seeing for blacks and Hispanics, and therein lies the puzzle. MS. ELLEN MEARAI think there's two responses you can have. One is, you know, why are they falling in those groups. They're seeing declines in cardiovascular disease. Blacks have seen declines in deaths due to HIV and AIDS. But second, you know, what you're not seeing is this rise in deaths due to these causes of despair, as others said before. And this is during a time, and I'm sure we'll hear from the other panelists, but this is a time when the economic circumstances are not really any better for these groups, blacks and Hispanics, and at times they are worse. REHMAnd John Haaga, I was struck by her point that among older Americans, those above 55, 60, even in their 70s, they seem to be doing better. HAAGAThis -- better than they were, yes. It should be pointed out the comparison to other countries, that mortality rates at all these ages, including for the older people, are not better than those in most other rich countries. So we've been enjoying a decline. It's terribly important, largely due to success against heart disease and stroke, but we're still well behind Canada, which we used to be even with, France, Germany, name it, among rich countries. So there's a general concern with speeding up mortality decline at all ages, really. REHMInteresting. Dante Chinni, how do you see it? MR. DANTE CHINNIThe interesting thing when I first started looking at this report was the geographic component, which of course they're just getting into now, but geography is what I spend a lot of time on, counties into different kinds of county, and when you look at that, what I've seen with the economic changes we've gone through over the last decade is the places that are missing out the most are rural communities. Rural America in particular has missed out on the new economy, and that has to do with a lot of things. MR. DANTE CHINNIIt has to do with transportation, availability in these places, has to do with education levels in these places. So just, you know, out of curiosity, once I read that story, I started running some numbers to see where in my types the unemployment rate was, things like that. So the unemployment rate is highest in, again, the three communities that are based on racial and ethnic minority groups. Hispanic centers, Native American communities and African-American communities have the highest unemployment rates. MR. DANTE CHINNIBut just beneath those are three communities that are white, aging and are rural. And these are Evangelical communities, as I call the Evangelical hubs down in the Bible Belt, working-class country communities, this is largely Appalachia, and graying America. These are communities, counties that are scattered really mostly throughout the North, some throughout the west, and they're overwhelming -- the big signifier with them is they're aging. MR. DANTE CHINNIThey do have sometimes slightly higher than average incomes, but it depends. The unemployment rate in these places is higher. It's higher by 0.2, 0.3 points, and that's something. But the thing that's really interesting when you get in the numbers is the percentage of people that are not in the workforce, so this is 16 and over, and they're just not in the workforce. In some of these places, graying America, these are the highest numbers, actually. The highest number is in the Native American communities, 48 percent not in the workforce in Native American communities. MR. DANTE CHINNIBut then right after that is these three communities. It's working-class country. That's Appalachia, 45 percent not in the workforce. Evangelical communities, 44 percent not in the workforce. Graying America, 44 percent not in the workforce. Now some of these communities are older. That doesn't mean that -- maybe some of these people don't want to be in the workforce, and that's completely understandable. If you've aged, and you're retired, that's just the way things are. But these numbers are very high, and they're much higher than urban and suburban places. REHMAnd Beth Kane-Davidson, Anne Case talked about the use of heroin. She talked about drug addiction. She talked about prescription drug addiction, as well as alcohol, all somehow leading to higher rates of death and higher rates of suicide. Is that what you're seeing, as well? MS. BETH KANE-DAVIDSONYes, we're seeing more people coming into treatment as a result of prescription drug abuse, heroin abuse and alcohol and specifically looking at how to deal with this population. Or medium age right now in treatment for suburban hospital is 50. So that has changed over the last year. You know, where we used to be seeing younger people, we still have younger people in there, but we are dealing now with what we call dual diagnosis. We have people in treatment with a primary diagnosis of addiction and then trying to look at depression, anxiety, mental health disorders going on and having to address both of those at the same time. REHMAnd are you seeing that within that age group that Anne Case and her husband have focused on? KANE-DAVIDSONAbsolutely, and I like the way she put it is, you know, this segment of the population is, you know, peeled away from the pack. You know, they've peeled away, and they're sticking out. You know, we're seeing, we're highlighting them, and how can we get these people into substance abuse treatment, and how can we address the depression, the, you know, despair that they may be feeling on a daily basis. REHMJohn Haaga, you wanted to add something. HAAGAJust noting this age group is -- these are the ages right before people become eligible for Medicare, and of course one of the links to the economic insecurity that Dante was talking about and that Anne Case and Angus Deaton discuss in their paper is that health insurance is tied to jobs. So a lot of people with job loss, they're losing their connection to health insurance, and these specific diseases of despair are also the diseases that rely on mental health treatment and substance abuse and behavioral (inaudible). REHMBut there is something else going on here, and Ellen Meara, I am wondering if you can talk about this. She looked -- they looked at people who had high school education and not much more, if they even finished high school. So clearly education is playing a part here. MEARAAbsolutely education is playing a part, as it has for decades. We've seen higher mortality rates in low education groups. And I think all of these issues at play here are higher in these less educated groups. Obviously the unemployment rates are higher. The lack of insurance that John Haaga is referencing is higher in this group. And rates of things like prescription opioid misuse are higher in those groups with lower education levels. REHMAnd Dante, you talked about the fact that this heroin epidemic is really taking over the country. CHINNIAnd you see it in rural America, which is really interesting. You go out to some of these communities, and, you know, look. I think a lot of us view heroin as something that is -- takes place in city alleys and people shooting up with heroin there. It's all over the country, and it's in places you don't expect. I have -- my in-laws are on Cape Cod. They say they've got massive problems on Cape Cod. I was out the Oregon coast, same problems out there. CHINNIMeth, also. Meth, heroin, drug use in these places, in part because, I think, look, there's hopelessness. There's also just, you don't have a job, you don't have anything else to do. This is -- and it's inexpensive. It becomes a crutch. REHMBut, you know, it's fascinating to me that the death rate among blacks is not rising in the same way it is among whites, and the question there goes back to expectation perhaps, education perhaps. What do you make of that part of it, Ellen Meara? MEARAThanks for asking that. You know, one of the things that's gone on during this period, as I said, economic circumstances haven't been great. And there's really a puzzle here. So take as an example, during the great recession, unemployment rates of course rose for everybody, but, you know, in all age groups, as in this middle-age group, they rose more for blacks and for Hispanics during the great recession compared to whites. MEARAAnd yet in 2010, a Pew survey asked people about their feelings about their future financial situation, and what you see in that is blacks are actually quite a bit more optimistic than whites, for example. So I think it really raises a puzzle, you know, why, given similar circumstances, are we seeing such a different response by group. REHMSo does it come to expectation? And among whites, there has somehow for decades and decades been the belief that I will do better than my parents have done, and perhaps among certain sectors there is a feeling, I'm here where I am, and that's as far as I'm going to go. Ellen? MEARAI think, you know, that was alluded to in the report, as well. I think that's going on. The nature of pensions have changed. So what you can expect at the end of these careers has changed. Really all these factors, but I think we don't have a definitive -- we haven't put it together in a definitive way yet. MEARABut I think these are good places to look. CHINNII do think that when we get done looking, I'm sorry to just harp on geography, but I think when we get done looking at the geography of a lot of this, we're going to find out this is heavily rural. In part it's because when you lose your job in these places, there's no place else to go. It's just, there aren't employers there anymore. Small manufacturing is gone. I mean, people think rural means agricultural. It doesn't. There's a difference between being agricultural and being rural. REHMBut at the same time, Beth, you're seeing addiction going on right here in the cities. KANE-DAVIDSONAbsolutely, and, you know, when you look at heroin overdose deaths, they have skyrocketed in the recent years, and they've quadrupled since 2000, and we're seeing that, as already has been mentioned, it's across the country. And so we have to address prescription drug use, abuse. We have to address alcohol use, and we have to address mental illness. REHMAnd you're listening to the Diane Rehm Show. John Haaga, you wanted to say something? HAAGAThere was a very important study done by the Institute of Medicine released earlier this summer, and part of it was comparing people born in 1930 and people born in 1960. The people born in 1960 turned 45 to 54 right at the beginning of this period. And what they found -- this is all across the ages and all race groups, and they found that for both men and women, all of the improvement in health between the 1930 cohort and the 1960 cohort, all of it came to the top half of the income distribution. HAAGAWe've really in this country, unlike other countries, left behind the bottom half. REHMYou know, it's so fascinating. I can remember speaking with then Secretary of Labor Robert Reich when the Clinton administration came in, and his talk about training, training for those who needed to move into new kinds of jobs, who needed to develop new skills, where has that training gone. And that's part of the problem. HAAGAIt is hard to know exactly what kind of training to even provide, I mean, because it is -- the jobs that are disappearing for this cohort, for people without a college education, there just are fewer and fewer of them, and good paying jobs, certainly going away. REHMEllen, do you want to speak to that? MEARAReally I would just, you know, emphasize what Dante has said, that the training -- you know, if you train for the jobs of today, you're not really ready for what's there five years from now, and that's what makes this different from job training of the '90s, for example. REHMAll right, and let's open the phones very quickly, first to Will in Lansing, Michigan. You're on the air. WILLHi Diane, thanks for taking my call. WILLI'd just like to bring up something that I -- you have already touched on it, but what I don't think anybody has mentioned is that due to the baby boom generation aging, in the '80s and '90s, when these people who we're talking about in this cohort were coming of age, they were being downsized. There was a lot of companies that were taking away health insurance, they were taking away pensions and retirement plans, trying to reduce overhead costs because the baby boom generation, which fueled the growth, had already gone by. REHMEllen, do you want to comment? MEARAYou know, obviously this is at issue, and, you know, you raise something that I actually wanted to touch on because, like Dante along with a colleague, we did some digging in some numbers. One thing you might think, well, what's happening to health insurance over this time period. Is that changing in ways that are different for whites compared with blacks? And if you compare over the whole time, 1999 to 2013, there's actually not much change for whites, and if anything there's a slight gain for blacks and Hispanics. So -- but not nearly big enough to generate the kinds of trends that we're seeing here. REHMEllen Meara is associate professor at The Dartmouth Institute for Health Policy & Clinical Practice. Short break. When we come back, more of your calls, your comment. I look forward to speaking with you. REHMAnd welcome back. As we talk about the declining death rates in most of the various ethnic and racial groups in this country, and the increasing rates of death among people 45 to 54. This new study by Anne Case and her husband, which has been widely reported. Let's go to Victoria in Los Angeles, California. You're on the air. VICTORIAYes, good morning. I always enjoy your show. VICTORIAI called in. I worked in Oklahoma at a company. The company got bought out one day. And also, the day after that was the 2008 crash. There was a white man who could not deal with that, because he lost 29,000 dollars in one hour. A black man lost 19,000. When we came up, we were offered another job, which was a lower paying wage. Us being African American and having to deal with so many diverse things all the time, we accepted the lower paying jobs. VICTORIAThe white guy, who was working at about 26 dollars an hour, he could not deal with that. He was escorted off the premises. He had a heart attack and in his rant, he said, well, the blacks and the Hispanics are taking our jobs. And he went into a total rage. He had a heart attack. And I'm calling because it's ideological and economics, to me, exactly what all the guests are hitting on. And ideologically, there are elements of white America that are between the age in 40 and 50 who have not adjusted to the diversities of America and still have a hard time adjusting because of ideology. REHMAll right. Thanks for your call. Ellen Meara. MEARAI think what you're hitting on there is really that the impact of these circumstances is, you know, as in your example, leading to a larger decline in income. It can be leading to, you know, a larger decline in status when you change jobs. And I think you're absolutely right, that in the face of those circumstances, what we're seeing is people are not coping. REHMI certainly hope that the impression is not being left that this is a program regarding racial bias in any way. What we're trying to understand and figure out is what's going on with those in white America between the ages of 45 and 54, leading to this uptick in the death rate. I thank God that the decline in the death rate is going on among African Americans and other racial and ethnic groups. What we're trying to get at is why this seems to be going in other directions. Beth, you talked about how many people are now coming in for drug treatment, addiction, for not only hard drugs like heroin. REHMBut prescription drugs and perhaps many of those people are indeed at a loss for jobs because they haven't had the education. What do they talk about? KANE-DAVIDSONThey talk about their struggles. And, you know, what you're talking about when people come in for treatment for alcohol or other drugs is we are also looking at depression, despair in our duel diagnosis program, which is very intense. They come every day, Monday through Friday. One of the first things we do is a check-in group. And we want to know, between when you left at 2:15 yesterday, and today at 10:15, how have you been doing? What are you struggling with? KANE-DAVIDSONThere really is more of an emphasis of, you know, the dual diagnosis component, not just saying, well, you need abstinence and you need to go to a self-help group. You need to understand that. That's all really important, but what else is going on in your life? How can we get you back on your feet? REHMAnd of the cohort we are speaking of, those 45 to 54, are you seeing more white people than maybe you did before? Are you seeing more white people generally? KANE-DAVIDSONWell, for suburban hospital, what we're seeing is more focused on the age group. Is that we're seeing more people in their 45 to 50s coming in for help. And I guess one thing that I want to highlight is, you know, as soon as someone realizes that a loved one is having a problem, they need to reach out and get professional help. REHMSomebody's beeper is going off. John Haaga. HAAGAWe are focusing, and quite rightly, on the economic problems and dislocations and the insurance coverage. I think that's important. But we also shouldn't let the healthcare system off the hook in this. There's a great run-up of opioid prescriptions, up until quite recently. Ellen's colleagues at Dartmouth have done a good study of trends and very recently, by dint of some efforts in multiple states, we've tried to get a handle of opioid prescription. HAAGABut that's a big concern, is the conversion of an opioid pain killer addiction to a heroin addiction pretty soon when people, because their insurance doesn't cover it. Or because the prescription is ended, turn to cheaper heroin as the source. HAAGAAnd those patterns of drug addiction are different in these different groups. So, while adversity is bad for everybody, how you handle adversity, if it's heavy drinking and painkiller use becomes a big problem. REHMAll right, let's go to Hannah in Kingsport, Tennessee. You're on the air. HANNAHYes, thank you for taking my call. First, I wanted to agree with the caller who recently called in about ideology and said that ideology -- I appreciated those comments. I live in the mountains in Appalachia and I am a professor, but I also serve at a church that is predominantly white. And one of the things that we have been noting is the statistics on the decline in spirituality across the board, across, at least the population of who we serve. But I wondered if your speakers could comment on the decline of spirituality in white America. HANNAHPerhaps as opposed to the other ethnic groups who we're talking about. And, you know, it's interesting, Tom Gjelten did a report yesterday. REHMOn "Morning Edition" about this decline in spirituality. CHINNIPugh just came out with a study talking about how the decline -- it's declined a couple more points. I do think I've got -- actually, I have to look at those numbers for something I have to write later this week. But I do think, when you look at those numbers, when I've looked at them in the past, the decline in spirituality, or at least in church attendance, has been greater, actually, among better educated Americans, people, who have -- it's atheism, being an atheist or being an agnostic is much more common among people who have a college education. But I do think it's an interesting point the caller raises. REHMAll right, and to Gill in Jamestown, North Carolina. You're on the air. JAMESYes, good morning, Diane. And thank you for taking my call. JAMESDiane, I wanted to reference access to healthcare as well as the issue of mortality. And I wanted to get your guests' comment. In 2006, Massachusetts passed their healthcare reform act and then, of course, the Patient Protection and Affordable Care Act known as Obamacare, was passed in 2010. But there was a very nice study published in the annals of internal medicine where they looked at CDC data, and this data covered individuals ages 20 to 64. JAMESAnd what I find as interesting, very interesting, is that mortality in the Massachusetts study, decreased by 2.9 percent compared to all other counties in the United States. And more importantly, mortality decreased by 4.9 percent into these states such as cancer, infectious disease, cardiovascular disease. And here, the reduction, I think, you know, points to access to healthcare as well as the tremendous reduction in mortality. MEARAYes, I'm familiar with that study, which really is encouraging about the potential for the expansion of insurance coverage. What I would point out is these declines are coming in cancer, infectious disease, cardiovascular disease. And we're seeing the truly stunning rises coming in these other diagnoses. Overdose, suicides, liver disease. And so, clearly, this comes back to something, to follow onto John's point, about things like prescription opioids, during this period, as it became more obvious that overdose deaths due to prescription opioids were accumulating, there have been many efforts to curb potentially hazardous use. MEARAAnd yet, if you look at the report, what you see is overdose deaths rising quite steadily throughout the period and not showing any sign of slowing down as of 2013. REHMAll right, and let's go to Mick in Jacksonville, Florida. You're on the air. MICKThank you for taking my call. The prescription opiates is what I've been wanting to talk about. I am a middle aged white man. I had a back injury in 2010, for which I was prescribed Oxycontin as well as Fentanyl and other high grade prescription opiates. When I lost my prescription, I did start taking heroin, because when I lost my prescription, and went into opiate withdrawal, for the first time in my life, I contemplated suicide seriously. And the only help I've been able to get is through a methadone clinic and it's been a lifesaver. MICKAnd I really think people need to find out about methadone clinics and suboxone clinics, because, you know, the prescribing has changed. You can't just go to any doctor and get 300 milligrams of Oxycontin a day anymore. You know, especially here in Florida. They, the state has really cracked down in this. So, I just want people to know that there is help out there, but you have to look for it. KANE-DAVIDSONYes. Thank you so much, Mick. And that is the pattern that we're seeing. It could be a sport injury, the back injury, they get on prescription painkillers. They start increasing use, increasing use, then suddenly can't get the prescription and turn to heroin. And there is help out there. And you have to look into the resources, call people, find that avenue for somebody to talk to and get to a person that can get them into treatment. REHMHere is an email from Pat who says, we're not talking about whites here, a group that includes many billionaires. We're talking about poor whites, the most marginalized people in the US. I hear a great deal of blaming the victim here. We must address income and wealth distribution, problems of political and economic inequality. Dante. CHINNII think the emailer is right in that we are talking about poor whites here. I don't know if I'd say they are the most challenged or economically challenged in the world we're dealing with now. I do think, it was really interesting, the call you had from the woman who talked about the people who got laid off. Look, we're talking about a generation that grew up post, the post- World War 2 boom. Right? My theory, when I look at all this stuff and I look at all the economic indicators over time is that we had this period from '45 to roughly 1980 where we kind of ran the world. CHINNIAnd everybody did get a job. And everybody could go to a factory and do well. And then, a lot of that went away. We're talking about a generation that came up after that. And, look, the people who really could get the job and have a good job, a good life, were the white population in the United States, particularly those who didn't have a college education, because there was a place to go. That's what's dried up with this group, and I do think that that's why they're struggling. REHMAnd you're listening to The Diane Rehm Show. Ellen, would you agree? MEARAI absolutely would agree that, you know, this is about poverty. This is about changes over time. I wouldn't get into contests over who is or isn't the most marginalized. But I would definitely agree that the outlook has changed compared to, you know, what peoples' parents faced and what they are facing now. REHMBut surely, they're going to have to do a lot more study here to begin to find, you know, are these the least educated? Are these the ones who grew up themselves without the advantages and simply couldn't make it? John. HAAGAYeah, the caller made a very good point about blaming victims. And that's not really the intent. In public health, really, all the great successes have come from multi-level attempts to improve the situation. There's a lot we should be doing in improving economic security, in improving people's access to health insurance and to high quality services, like the one Beth described. There's other things we should be doing. Our great successes, like motor vehicle injuries have come from multiple levels of improvement. REHMAnd here's a final email. And it's from Gina in Cincinnati. She says, a reduction of so many societal ills is accredited to education. Why is it that less than 10 percent of our government budget goes to education? We would get a lot more bang for buck spending money for free, quality, public education with a low student to teacher ratio. Instead, we spend tax dollars primarily for war than healthcare, prisons, unemployment, food stamps and the like. It seems common and yet it carries no weight. REHMWell, we're going to have to leave it there. Earlier, you heard from Anne Case, Professor of Economics and Public Affairs at Princeton University. Here in the studio, John Haaga of the National Institute on Aging, Beth Kane-Davidson of the Addiction Treatment Center at Suburban Hospital here in suburban Maryland. It's a part of the Johns Hopkins Medical Institute. And Dante Chinni, political reporter for the Wall Street Journal. From New Hampshire, Ellen Meara, Associate Professor at the Dartmouth Institute for Health Policy and Clinical Practice. Thank you all so much.